One of the shots I took in the week after Easter. This was an interlude in the song writing camping fest! 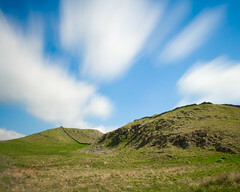 It is taken with an ND 110 filter so it was about a minute of exposure on a tripod. Just over the ridge is that tree from Robin Hood Prince of Thieves. You know…. just out of shot….